Luis Arenal Bastar was born in Mexico City, Arenal was almost entirely self-taught as an artist. While in his early twenties, Arenal began to work with and assist David Alfaro Siqueiros. He was one of the founding members of the TGP along with Leopoldo Mendez. He spent a seminal time of his artistic career in the United States receiving a number of key commissions for murals. A muralist as well as printmaker, sculptor and painter, the work selected for this exhibit displays his skillful transmutation from muralist to printmaker. 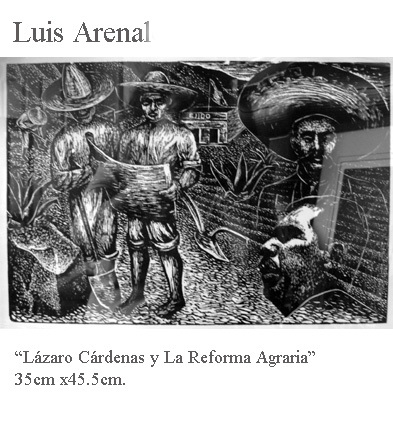 “Datos Biograficos de Luis Arenal Bastar (1909 – 1985)” was shared with us at the Opening Reception of the Exhibition that took place at the Howard Community College in Columbia Maryland in september of 2008. All content ©2014 Virgilio Blanco.